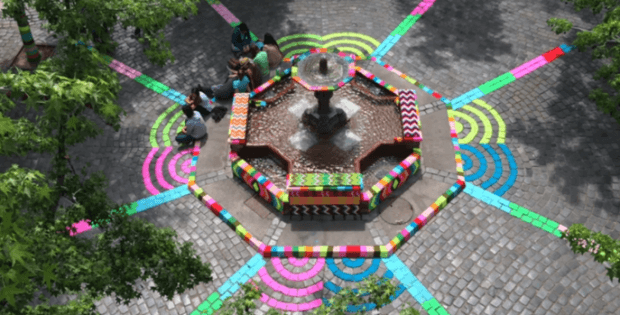 Magda Sayeg is the textile artist considered to be the mother of yarn bombing. She lives and works in Austin, Texas, and creates street art using yarn instead of paint. Having started with covering one door handle with a knitted piece, her graffiti style textile revolution has swept across the world. She knits or crochets her pieces in contrasting patterns and colors. The finished pieces are then used to cover anything you can imagine from tree trunks to even buses. Marta started yarn bombing over 10 years ago, and feels it was a case of being at the right place, at the right time. In fact, the DIY movement had begun and crafts were becoming popular again. Little did she know what the implications would be of her wrapping her first stop sign pole. She used to work on her own, however, now Marta works with a skilled team. Her larger projects have two parts; the first part is the production of the material and the second part the actual installation. In total, the entire process can take from 2 to 6 weeks. Good question! I knit more than I crochet but I prefer crocheting to knitting. Crocheting is like sculpting. I can take any random object, like my skulls, and crochet every detail rather easily. Knitting isn’t like that—I would lose all the details. BUT I can produce knitted material faster than crocheted material. There are knitting looms and machines that speed up the process. As far as I know, there are no crocheting machines. In this TED Talk video, Magda Sayeg talks about how it all started and how yarn bombing changed the course of her life.